对不起，此内容只适用于美式英文和泰文。 For the sake of viewer convenience, the content is shown below in this site default language. You may click one of the links to switch the site language to another available language. 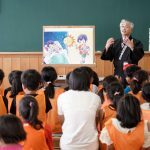 Tenrikyo Church Headquarters hosted the Children’s Pilgrimage to Jiba between July 26 and August 4 under the new theme “Gratitude! In joy we are united, to the Home of the Parent!” For this annual summer festival, a total of 221,098 children and adult leaders returned to the Home of the Parent from all over Japan and 25 overseas countries and regions, including Australia, Brazil, Canada, Colombia, the Congo, France, Germany, Hawaii, Hong Kong, Italy, Kenya, Laos, Mexico, Mongolia, Nepal, the Netherlands, Paraguay, the Philippines, Singapore, South Korea, Taiwan, Thailand, the U.K., the U.S. mainland, and Vietnam. The children came away with lifelong memories they made through participating in a variety of activities and attractions and staying together with other children in followers dormitories. The event kicked off at 1:00 p.m. upon the conclusion of the July Monthly Service at Church Headquarters. 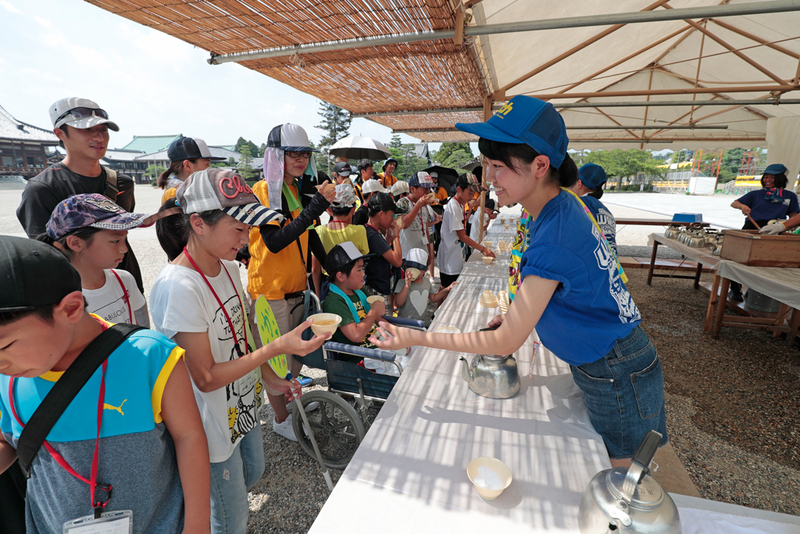 The high temperature exceeding 35°C (95°F) on most days during the 10-day period, the Boys and Girls Hinokishin Corps members, assigned to tea tents scattered throughout the event venues, served ice-cold tea to pilgrimage participants. On July 28, members of the Overseas Boys and Girls Hinokishin Corps from six countries and regions such as the U.S.A., Mexico, and South Korea recited the Association Pledge in their respective languages at the “Morning Service” event. There were also a number of groups organized by local churches that had been affected by the earthquake that struck the northern part of Osaka Prefecture earlier this year in June. This year marked the 40th year since the Oyasato Parade was first held in 1979. Every night after the evening service at Church Headquarters, some 100 fireworks were set off in the night sky in the Home of the Parent, kicking off the Oyasato Parade. The spectators were overjoyed at seeing a number of splendid floats as well as orderly marching bands. The end of the Oyasato Parade was marked by a spectacular performance by Tenri Kyoko Gakuen High School Marching Band. Children who saw the placards that read “Toward Tomorrow” cherished the good times they had during the day as they went back to their respective followers dormitories. After the Oyasato Parade on the last day of the pilgrimage, the closing ceremony known as “Finale” took place, where the participants pledged together to come back again next year. 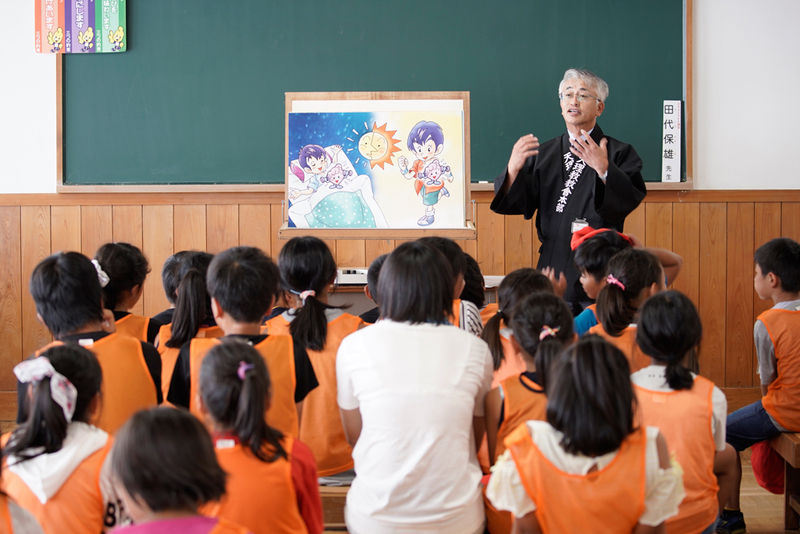 During the Children’s Pilgrimage to Jiba, the Doyusha Publishing Company posted a total of 27 articles about the event along with photos and videos on social media such as Facebook and Instagram. 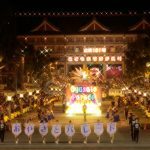 Particularly notable were several videos broadcast live on Facebook and YouTube showing scenes from such sites as “Children’s Alley,” “Tea Service Center,” “Curry Dining Hall,” “Hop, Step, Marching World,” and the Oyasato Parade, enabling viewers to see what was happening during the summer festivities in the Home of the Parent in real time. Doyusha also posted on Instagram many photos that its staff members took at various sites during the Children’s Pilgrimage, using their smartphones, so as to show their pictures as soon as they could. A total of 57 posts were published during the event, which drew 9,100 likes and 105,000 views.